The beautiful and talented Jill Flint plays hospital administrator Jill Casey. The USA Network medical comedy drama television series “Royal Pains” is now in production on it’s fourth season, and the extras casting director is hiring New York background performers to work on the hit show. Needed are people available for shoots in Westhampton, NY on April 30, 2012 and Southampton, NY on May 10, 2012. Also needed are people with ultra high-end cars. Both union and non-union applicants will be accepted. Season four of “Royal Pains” premiers on Wednesday, June 6 at 9/8c on USA. Twentieth Century Fox Film Corporation’s feature film “Broken City” is currently shooting in the New Orleans area and the extras casting director is seeking people to work on the film in January, 2012. This is fully paid work and no prior experience working as a background performer is necessary. Candidates must be located within reasonable driving distance of New Orleans. Disney Channel sketch comedy television series “So Random!” is currently in production and the show is casting actors with strong improv and comedy skills, as well as extras and stand-ins for the series stars. The show was formally titled “Sonny with a Chance”. The long awaited “Ghostbusters 3” is finally set to go into production early spring 2011. Initial casting for the film’s main characters will take place in Los Angeles. A new younger generation of Ghostbusters is to be introduced. 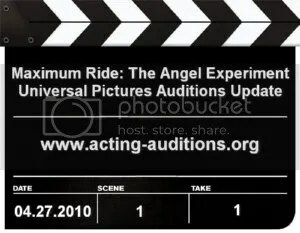 Universal Pictures has bought the rights to ‘Maximum Ride: The Angel Experiment’, based on the best-selling young adult novel series by James Patterson. Columbia Pictures has put the film into turnaround. Catherine Hardwicke is still directing the film and will hire a casting director when the new screenplay final draft is complete.